Running time: 98 minutes approx. How do you follow a film like Frozen, one of the most successful films of all time, and certainly the most successful animated feature film of all time? A question that Disney no doubt asked themselves some time ago. With John Lasseter at the helm, the current head of animation and industry veteran, the answer was, and indeed remains, clear: variety and contrast. For as Frozen was released to the world in 2013, so Big Hero 6 was already well into full production. No one expected Frozen to be the multi-billion dollar success that it has become, and I cannot imagine that Disney, let alone anyone else, expects Big Hero 6 to rival that success (its box office in the US alone has reached nearly $500million, so it is not exactly a failure). The current motto at the Lasseter-run animation studio seems to be to keep it fresh and varied (aside from Planes and its sequel, of course, both of which follow the tried and tested format of cutesy vehicles in peril format, in the Cars template): from dog-with-a-purpose Bolt, back in 2008, through the more traditional, yet innovative and ground-breaking (Disney’s first African-American heroine), The Princess and the Frog in 2009, to fairy tale-with-a-wink Tangled in 2010,videogame-set adventure Wreck It Ralph in 2012, and the mega-smash Frozen in 2013. 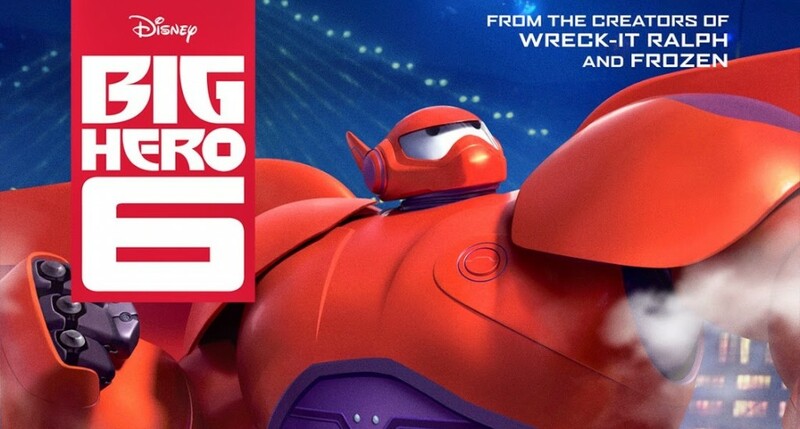 We now reach Big Hero 6, the first fully fledged team-up of Disney and Marvel (the former owning the latter), and Disney’s first superhero movie. Big Hero 6 is a loose adaptation of a Marvel comicbook series (Sunfire and Big Hero 6), featuring a Japan-based superhero team, tweaked liberally for its animated counterpart. And it is a joyful blast of entertainment, its 98 minutes running time a rollercoaster of action, thrills and blissful eye candy. For anyone at home with superhero comics or movies there are lots of familiar, but not weary, tropes to settle you into its world. The setting is the semi-futuristic (and NOT part of the Marvel Cinematic Universe, which had been a rumour doing the rounds) city of San Fransokyo. This unusual melding of cities is never really explained or delved into but provides a wonderful glaze of Japanophile style via kitsch Americana. An almost anime-flavoured Metropolis of the future, if you will. Special mention must be made of how utterly glorious the visuals of Big Hero 6 are: it is a stunning looking film, with slick, funky design work. (The character animation in particular has stepped up, even since that of the none-too-shabby Frozen). Credit is due to Production Designer Paul A. Felix and to Art Director Scott Watanabe and their respective teams for their incredible work on this, quite possibly the most visually stunning Disney movie in recent history. No superhero film is complete without its heroic central character, and here that role falls to the troubled young teen tech-wizard, Hiro Hamada, a genius wasting his talent on robot wars-styled gambling bouts (gambling in a Disney film!). Very early in the film, Hiro’s older brother, Tadashi, a Robotics student, concerned that Hiro is wasting his talents, encourages Hiro to apply for a place on Tadashi’s course at the city’s university. Hiro rises to the challenge and invents the microbots, a swarm of tiny robots which can be manipulated into forming shapes at the will of the wearer of a special remote control headband device. He is accepted onto the course by the tutor Professor Callaghan (voiced by James Cromwell), and here we meet the rest of the colourful supporting cast, an assortment of geek tech-heads, taken straight from the comicbook series; there is GoGo Tomago, a tough young athletic gal; Honey Lemon, who is the saccharine opposite; Wasabi, the athletic OCD neat-freak, built like a football player (and voiced with aplomb by Damon Wayans); and then there is Fred, the comedy relief, a monster-obsessed nerd (voiced by the light relief vehicle that is T.J. Miller). It is in these early character building scenes that you get a great sense of a team coming together, as they interact fluidly with each other, displaying their various contrasting tech-themed talents. Soon after joining the course, Hiro and the other students take part in a technology expo and it is here that Hiro gets to demonstrate the power of the microbots in an eye-catching way, attracting the attention of billionaire industrialist entrepeneur, Alistiar Krei, who makes him an offer on the spot to buy his ‘bots. Professor Callaghan, who seems to have a grudge with Krei, advises Hiro to ignore Krei’s advances, and Hiro decides to follow his tutor’s advice. 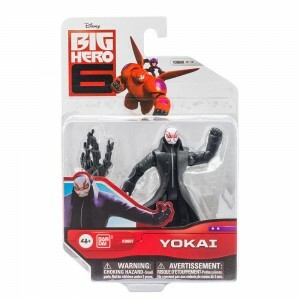 Big Hero 6’s villain, Yokai. Disaster strikes that night, a fire destroying the expo and all-but-one of Hiro’s microbots, altering Hiro’s outlook drastically and leading him to seek seclusion from the rest of his student friends. In his isolation, he inadvertently discovers the personal healthcare robot, the lovable and freshly minted screen icon that is Baymax, created by Hiro’s brother Tadashi. Baymax activates the remaining microbot, which begins to act like a compass, leading Baymax to set off across San Fransokyo. Hiro chases after and they discover a mysterious warehouse, where Hiro’s microbots are apparently being mass produced by a sinister, masked nemesis (named Yokai in the range of merchandise). Yokai chases them away and Hiro and Baymax manage to escape. Hiro decides that to further investigate the masked stranger, clearly up to no good, he must rejoin his student comrades – and then they must form a superhero team. It sounds a jump, but the scene where this takes place, at the mansion of Fred’s parents, makes it seem a natural leap of logic. We get a fun montage sequence where Hiro designs their outfits to suit their tech talents – Fred’s monster fetish is satisfied, for example, whereas GoGo Tomago’s speed-freak experiments are rendered into a Tron-esque suit with motorized ankle appendages. The plot ratchets up a level, and there are twists and turns aplenty (you will find no spoilers here! ), revelations are made, villains are unmasked, motivations are laid bare, disaster inevitably strikes, sacrifices happen, and we are left with one of the finest superhero films, and Disney animated features, to date. It this is a taste of what the Disney-Marvel partnership can produce, then we are in for some excellent future films, including, hopefully, a return to the world of Big Hero 6. And, like the best animated features, there is something special about Big Hero 6 that means kids and adults will enjoy watching it together. (My five year old daughter and I love this movie). Miss this and you deny yourself a real treat.